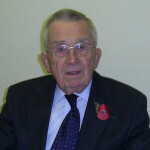 The town council in September 2014 took the historic step of granting the freedom of the town to Frederick William Jakes, better known to all as Eric. For the newer residents of our community it may help to explain the background to the how’, why and what led up to this momentus decision. Eric Jakes is a Potton man born and bred. He was born 8th. May 1928. 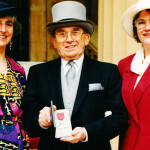 At the relatively young age of 27, for those days, he was elected onto Potton Parish Council as it was then in 1955. He has served continuously on that council until his recent ill health forced him to retire. 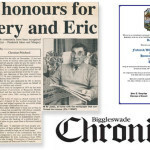 During that time he has also served on the old Biggleswade Rural District Council and subsequently on Mid-Beds District Council which were both forerunners of the current Central Beds Council. During his tenure on all these authorities he held the position of chairman. Apart from his civic duties Eric was also a governor of Burgoyne Middle School for over 30 years, serving as chairman for much of that time. He has been a regular at St. Mary’s Church since he was a boy, serving on the PCC holding many offices including church warden. When he retired as warden he was honoured with the title of warden emeritus. For many years he was a member of Potton Consolidated Charity, serving as Chairman of that body until ill health forced his retirement. During his spare time he has been a member of the history society. So how can you repay a man who has given and put so much into his community for so many years? The answer was the 1972 Local Government Act that allowed local authorities to honour a citizen(s) in this way. So that was the decision of Potton Town Council at a special meeting in September 2014. 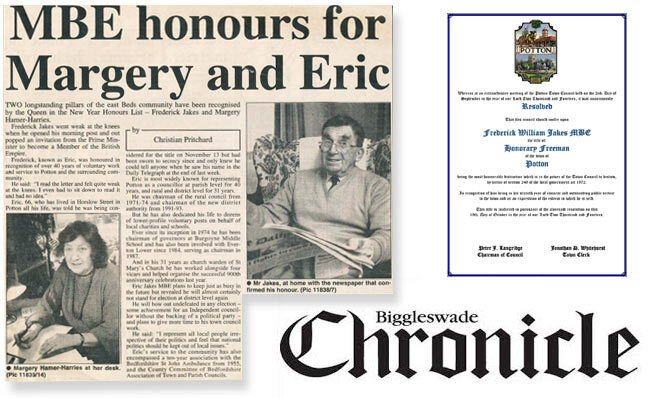 Every year the bells of St Mary’s Church ring on the 8th May to celebrate Eric’s birthday. Frederick (Eric) William Jakes MBE, Freeman of Potton passed away on Monday 12th December 2016 at 7.55pm.